The exact meaning of navratri is "the nine promising nights". Durga is reckoned as the "Goddess of Power" and during the festival of Navratra we love to decorate your home. On such an occasion, one would definitely love to make beautiful Rangolis outside their homes to show their love towards the festival. You can make a stunning rangoli design to make your Navratri more auspicious and thrilling. 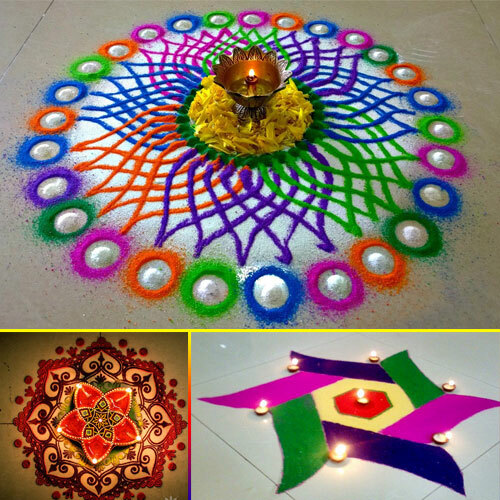 For such a rangoli design, you can employ traditional colors like red and green. Enhance its beauty by adding some beads to it so that it looks ethnic. Try making this ethnic rangoli in a circular design and even if you make it small, it will look fabulous owing to its bright color selection.